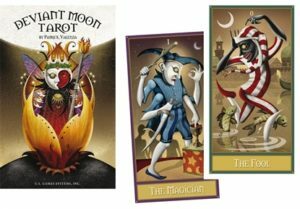 The Oracle Soup kitchen table was covered with strange ingredients as they prepared a special recipe for their Kitchen Table Conversation with Patrick Valenza, creator, artist, and writer of the Deviant Moon Tarot. Gina and Katrina, the Oracle Soup sista’s tripped down memory alley with Patrick’s recall of Long Island, its many cemeteries and insane asylums, with their influence upon young Patrick and his early fascination with Tarot. After listening to him it is easy to understand the meaning of the veil being thinnest during this Fall season as we approach Halloween and Samhain in the Northern Hemisphere.